Babine Lake Marine Park – Pendleton Bay Site is one of 6 sites that comprises Babine Lake Marine Park. These sites all lie along the shores of Babine Lake and include Smithers Landing, Hook (Deep) Bay, Pinkut Creek, Pierre Creek, and Sandpoint sites. The park is about 45 km north of the closest community of Burns Lake. It is located on the southwest shore of Babine Lake. Follow Babine Lake Road north of Burns Lake for 20km. Turn left onto the Augier FSR and follow this for 10km. Turn right at km 47 and follow this road 5 km to the park. Anglers will enjoy the challenge of fishing for rainbow trout and char in the wilderness area of Babine Lake. Anyone fishing or angling in British Columbia must have an appropriate licence. Pets/domestic animals must be on a leash at all times and are not allowed in beach areas or park buildings. There are no off-leash areas. You are responsible for their behaviour and must dispose of their excrement. There is a gravel/brick boat launch with a moderate grade available at this park. There is limited parking available for boat trailers. It is not recommended to leave a trailer parked or boat moored overnight. Campfires are permitted but firewood is not provided. To preserve vegetation and ground cover, please don’t gather firewood from the area around your campsite or elsewhere in the park. Dead wood is an important habitat element for many plants and animals and it adds organic matter to the soil. You can conserve firewood and air quality by keeping your campfire small. 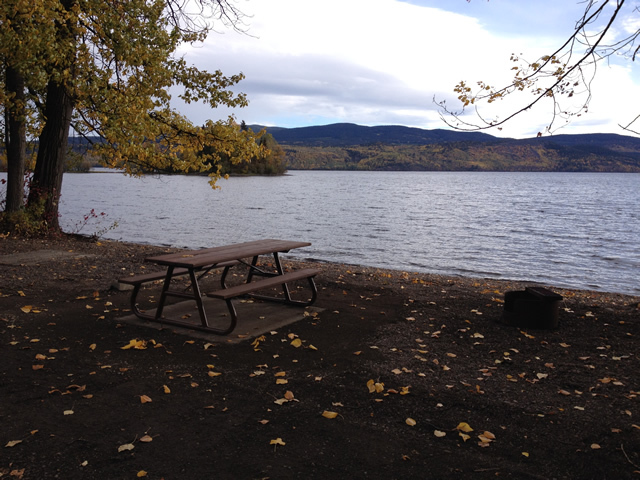 Limited burning hours or campfire bans may be implemented and some parks may use communal fire rings. Be prepared to bring a portable stove for cooking. Potable water is not provided at this park. Visitors must bring their own water. This park offers vehicle accessible campsites on a first-come, first-served basis – campsite reservations are not accepted. There are 16 regular size campsites. Some are under tree cover and others are beach front. There is limited parking available for extra vehicles. No camping fee currently charged at this park and no services are provided; it is user maintained.